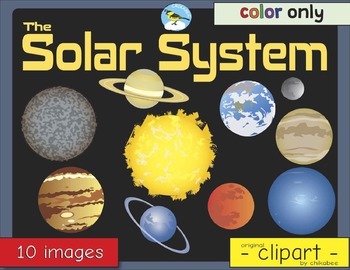 This clip art packet includes 10 images from our solar system. Images are provided in color only. Please see the list xbelow. PNG format with transparent backgrounds. 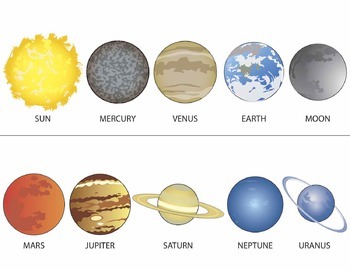 These graphics can be used in your personal documents, lessons, or resources. Please do not redistribute any digital clipart pieces alone. All graphics should be incorporated into an original design or resource before being shared with others. Please make sure all digital files are secured in a PDF file or another secured format so that the clipart cannot be copied and used by others. You may use any free graphics or paid graphics for products you create including but not limited to: Teachers Pay Teachers resources, web/blog designs and Etsy products. -If using free or paid graphics in any digital products for sale, you must provide credit to Chikabee by including my Teachers Pay Teachers website somewhere in the file/credits page of your product. -In all free resources and products, please make sure the file is secured. This is to protect your clipart purchase and my creative rights as the designer.